Bokor Hill Station Tours to Bokor are perhaps the most popular out of Kampot. The Bokor Hill Station on Phnom Bokor (Bokor Mountain) is a mountaintop collection of buildings (hotel, casino, church, royal residence, etc. ), constructed by French authorities in the early 1920s as a complement to the already popular Kep resort area. In the 1990s a travel author referred to Bokor as the eeriest place in the world, and it lives up to that reputation. In its time, Bokor was an elegant getaway for French officials and foreign visitors to old Indochina - a classic colonial hill station located in the mountains to allow foreigner visitors accustomed to more temperate climes to escape the tropical heat. But years of neglect have left ghostly ruins - vestiges of a different age, often shrouded in fog and clouds. One thing that the years have not changed is the absolutely spectacular view of the coast and the cool (sometimes cold) mountain air. Bokor Mountain is heavily jungle and trip beyond Bokor, including jungle trekking, can be arranged. Wild elephants and other jungle animal are occasionally seen. News: In January 2008, Bokor Hill Station was closed to visitors as work began on a new development project, including refurbishing the casino and hotel and the addition of a new hotel complex. Since the beginning of the project, access to the Hill Station has been irregular. As of August 2008, access is limited to those who went as part of a tour group or with a tour guide. Access rules may change again, perhaps allowing visitors individual access once again. Check with your guesthouse for the latest information. Regular all day tours up the mountain run about $15/pax plus a $5 park admission fee and includes transport, guide, lunch and some also include a sunset boat ride back to town. Tour operators can also organize jungle trekking and overnights on the mountain. One immediate benefit of the development project has been the improvement of the road up the mountain, drastically reducing travel times. 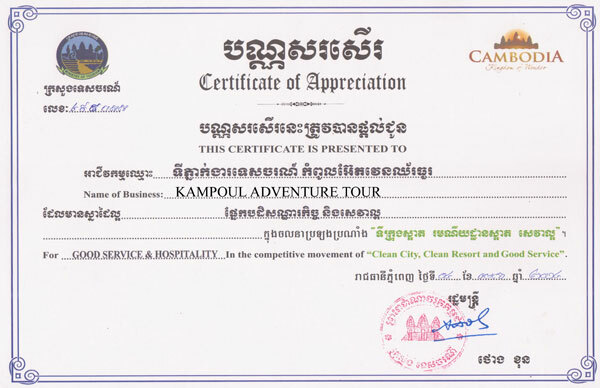 The Park Office and turn-off to the Hill Station is 37km west of Kampot. Limestone Mountains (phnom) dot the landscape between Kampot and Kep. Many contain limestone caves, some adorned with exotic rock formations, and almost all containing Buddhist shines. Make sure to bring a torch and wear shoes suitable for climbing on rocks. - Cave # 1 Pre-Angkorian ruin set in a limestone cave amongst stalagmites and stalactites that are slowly growing back into the ruin. Small, 4th-5th century AD brick structure associated with the ancient state of Funan. A bit of carving is still visible. Look for the limestone formations near the entrance of the cave in the shapes of elephants. - Cave # 2 The entrance is about 300 meters from Cave # 1 in the same limestone outcropping. Very little in the way of formations, but quite deep, requiring climbing over piles of rock and through small openings. Small shrine. A picnic area on the Prek Chhak river. Popular with the locals, especially on weekends. Lots of food/drink stalls. The cool rapids and river breeze are quite pleasant. Nearby Asian-style mini zoo displaying a variety of local fauna. 8km. Good road. Also known as the White Elephant Cave located next to a colorful pagoda. The stairs up the side of the outcropping provide a beautiful view of the countryside, especially during the wet season. The cave contains a shrine at the base of a limestone formation alleged to resemble a white elephant. Kampong Trach is the district that borders Vietnam. The road trip from Kampot to the main town passes though some picturesque rural areas. There is a new side road to Kampong Trach town that skirts the base of Phnom Voar, (where the victims of the 1994 Khmer Rouge kidnappings were held.) These mountain areas of Kampong Trach were one of the last Khmer Rouge holdouts. Kampong Trach town is small and relatively uninteresting. The areas main attraction is a series of limestone caves and tubes that have been carved into a nearby mountain. The roof of a large cave in the center of a mountain has collapsed, making a small, enclosed jungle. Pagodas and shrines have been built amongst the caves, providing for some excellent photo possibilities. Bring a flashlight and wear good walking shoes. The cave at Phnom Sla Ta'aun Plain by comparison to other caves, but still an interesting climb. Look for the huge rock balanced in a hole in the ceiling. Small shrine. Kep Beach A single, kilometer long crescent of sand near the tip of the Kep peninsula. Dining platforms and seafood vendors line the road behind the beach. Busy on weekends but often deserted during the week. The road through Kep traces the coastline to the beach and then circles back on itself. Cars and vans must pay admission to drive the loop (2500R-5000R). Motorcycles and pedestrians are free. Be aware that the loop is an one way street and the police do occasionally enforce the law, levying fines against violators. Rabbit Island (Koh Tunsay) Rabbit Island is a small beachy island about 20-40 minutes from Kep by local boat. Make a day trip to the island - going in the morning and returning to Kep in the afternoon - or stay the night. Lazy, secluded white sand beaches and coconut trees. Relatively clear, warm waters. Snorkel around the rocks. Theres no coral but lots of colorful fish. There are now some very basic guesthouse bungalow facilities on the island - rustic beach bungalows for less than $10 and a couple of rudimentary restaurant/bars. Arrange a boat trip to the island through your guesthouse in Kampot or Kep or just go to the Koh Tunsay Boat Dock in Kep town next to the Long Villa Restaurant. Boats are almost always available.